James Dahlman, assistant professor in the Wallace H. Coulter Department of Biomedical Engineering at Georgia Tech and Emory University, and a researcher in the Petit Institute for Bioengineering and Bioscience, has been named to MIT Technology Review’s prestigious annual list of Innovators Under 35. Dahlman is a bioengineer working at the interface of nanotechnology, gene editing, and genomics. His lab develops novel ‘big data’ technologies and applies them to the study of nanomedicine. One such application is the use of DNA barcodes to track thousands of nanoparticles directly in vivo; typically, labs will study a few nanoparticles in vivo. 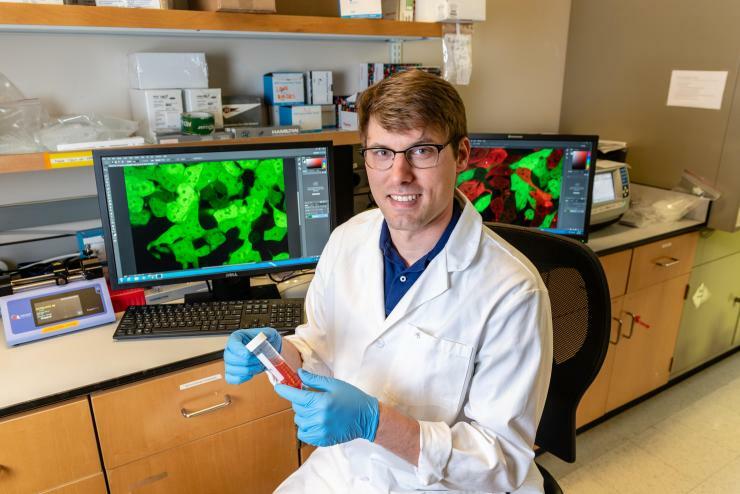 His lab also has pioneered the use of DNA barcoded nanoparticles, and is using this powerful new technology to design nanoparticles that deliver genetic drugs to target tissues. He has designed nanoparticles that deliver RNA drugs to blood vessels; these nanoparticles have worked in more than 20 labs and are under consideration for clinical development. At the age of 31, he already has published in Nature Nanotechnology (twice), Nature Biotechnology, Cell, Nature Cell Biology, Science Translational Medicine, PNAS (twice), JACS, and other prestigious journals. In addition to the Technology Review honor, Dahlman has won many national and international awards, and since 2014, has given dozens of invited talks at leading universities around the world on drug delivery and DNA barcoding. For more than a decade, Technology Review has recognized exceptionally talented technologists whose work has great potential to transform the world. Previous Innovators Under 35 include Larry Page and Sergey Brin, the cofounders of Google, Mark Zuckerberg, the cofounder of Facebook, Helen Greiner, the cofounder of iRobot, and Jonathan Ive, the chief designer of Apple. Founded at the Massachusetts Institute of Technology in 1899, MIT Technology Review is a world-renowned, independent media company whose insight, analysis, reviews, interviews and live events explain the commercial, social and political impact of new technologies. MIT Technology Review derives its authority from the world's foremost technology institution and from its editors' deep technical knowledge, capacity to see technologies in their broadest context, and unequaled access to leading innovators and researchers. MIT Technology Review’s mission is to bring about better-informed and more conscious decisions about technology through authoritative, influential and trustworthy journalism.